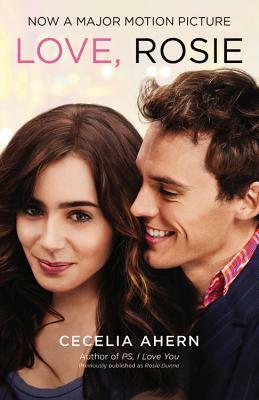 Presenting Love, Rosie by Cecelia Ahern. The basis for the forthcoming motion picture starring Lily Collins and Sam Claflin! Epistolary. Wasn't really expecting that when I began reading this book ...... but a very nice surprise nonetheless. Also this is the first book I read of Ahern so it was momentous in that context as well. "Where Rainbows End" - "Rosie Dunne" .... and now "Love, Rosie" ..... Since its release this book has gone by many names and its varying shades of covers. Although at heart this is the sweetest tale of two best friends who are just perfect for each other but can't seem to work it out. Rosie and Alex. Best friends since childhood, meant to be together. Everybody knows that expect them and they just can't seem to get it right at all. The story follows their long journey through life towards each other kicking and screaming and dealing with their fair share of nasty troubles and significant others and families along the way. Really they are not perfect creatures in any way. With their own perfect share of the happy, sad and the bitter and most of all the hilarity of it all ..... Somehow they manage. Love, Rosie may tell its story only through letters, emails, text messages, chat room talks, IMs and newspaper articles but you can see the development our characters go through. The conversations are not really dated so it might be a bit difficult to set a time frame at first but if you proceed slowly through, it becomes apparent just how much time had actually passed. The shenanigans of life and of Rosie & Alex are more than enough to keep us hooked and entertained. Okay. Confession time - I really only read the book because I saw the movie .... I know shame on me, I should have known well enough to read first but I liked the movie well enough ..... Sam Caflin & Lily Collins were the cutest pair ever ..... But ... But now that I have the experience of the book I know better. While the movie was sweet enough, they tried to cram a lot in that time-frame and showed more scenes but it now feels rushed to me. Really, be it the movie or the book, I loved getting to know these characters. Sharing their lives and its hardships, challenges and its moments with them. The writing style and the authenticity of epistolary just sets this whole thing off to even great heights. "The sweet and endearing destiny of two best friends meant to be together"
Ah, I think this one might get a bit confusing for me because of all the time frame issues and it might bother me that it is not actually told through it being a story. Perhaps I will only see the movie instead.